How to Socialize Intolerant Dogs with Other Animals – Dogs intolerant of other animals may leave many tutors worried. And no wonder, owners want their dogs to be happy and quiet. And it is very stressful situations in which the dog meets with other dogs and shows itself troubled, barking, running away or even advancing on the other dog. This situation not only bothers the owner as it is very stressful for the dog. In this article we are going to talk about these dogs that are not only shy, but are intolerant of other animals. And know what you can do to help your furry. So the two can lead a more peaceful and healthy life. An insecure dog, with a trauma like being attacked by another dog. Or even jealous of the owner, can attack another dog. These intolerant dogs because of fear are usually small. But nothing prevents a large dog from attacking for the same reasons. Little socialized dogs that do not walk around enough. Dogs of owners who did not socialize them as puppies. These animals are generally intolerant of other dogs as adults. That’s because they have not learned to live with other animals, and may be very docile dogs that just do not know how to live with other dogs. Females close by, territorialism, hormones may help some dogs not get along with other dogs. Especially in the case of males, making dogs intolerant. But this motive is usually not the only one, being that it mixes with the others. The first step in helping your dog get calmer close to other dogs is by using positive reinforcement. Take your dog for a walk, near a dog park, for example. But without going in let him watch the other dogs. When the dog is calm, that is, quiet, with relaxed body, tail swinging. Walking without advancing on the other dogs or without looking at them, then give a snack. He needs to feel that it’s a good thing to be around other dogs. At first it is ideal not to get too close to other dogs. Go lower that distance and getting closer and closer. Always reinforcing that he is very calm and rewarding the tranquility with snacks and carinhos. When the dog is able to get close to other dogs in peace, then introduce it to other dogs. It may be in the park itself, interacting with another dog. Or with a friend’s dog, you can ask for help. Give preference to quiet dogs, if the other dog is also not balanced will not work. For one can be frightened by the other and return to the previous situation. Do not force it, do not push it to the other dog, do not pull or drag it through the collar. It takes a lot of patience to deal with dogs. Especially in situations like these with dogs intolerant of other dogs. Be very patient, if you are always calm, because this attitude will help your dog. Do not yell, do not pull, do not hit you, in addition to crime, none of this will help you. On the contrary, it will only make the dog feel even more uncomfortable with the situation. Spend your dog’s energy and provide a comfortable living. So he has no reason to stress. Some dogs spend the day protecting the house from other dogs passing by on the street. That’s because they have nothing to do, spend the day alone on the terrace without toys. No problem raising the dog on the terrace or yard, as long as it is roomy for him. But indoors or in the yard, provide a comfortable shelter and occupation so that he does not distract himself “defending the home”. We often try hard and still do not work. Do not blame yourself for it. If you made a mistake you are trying to help your dog now and this is already a great step. But unfortunately depending on the dog and various other factors, it may not work. In that case, or if you are afraid to put the above tips into practice alone. You can ask the help of a professional. 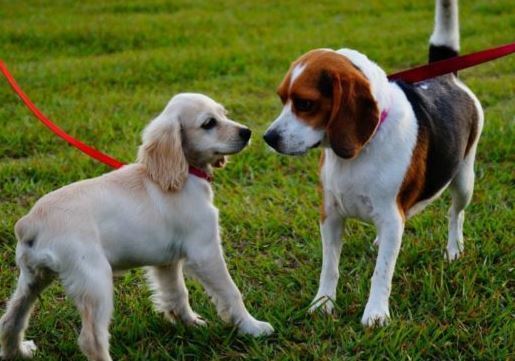 A good trainer will help you socialize your dog intolerant with other dogs. But stay tuned for the trainer’s techniques. No hangers, jets of water and tugs on the tab. Look for a good professional who uses positive reinforcement and a lot of affection, he will not only help with the problem, but will also teach you in practice to deal with doubts.